From our production table and off to the post office. This is by far one of our favorite save-the-date designs for a Bat Mitzvah. 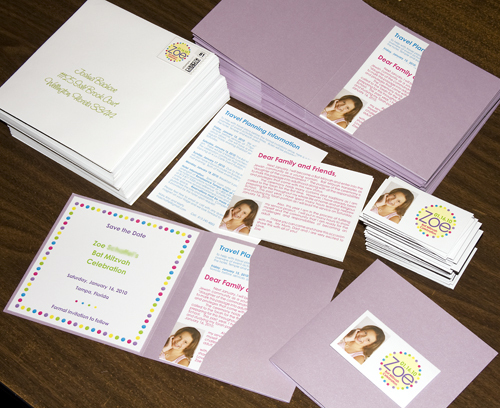 We used colorful polka-dots in lime green, purple, hot pink and aquamarine; a custom-designed logo for the magnet (affixed to the front of this 6×6 Portfolio in Alpine); and custom stamps complete the ensemble. It is as functional as it is cute: Travel and Hotel information is printed on one insert, and a letter from the guest of honor is printed on the second enclosure. We love this personal touch! This entry was posted on May 11, 2009 at 1:43 pm and is filed under Mitzvahs & Sweet 16s. You can follow any responses to this entry through the RSS 2.0 feed. You can leave a response, or trackback from your own site.